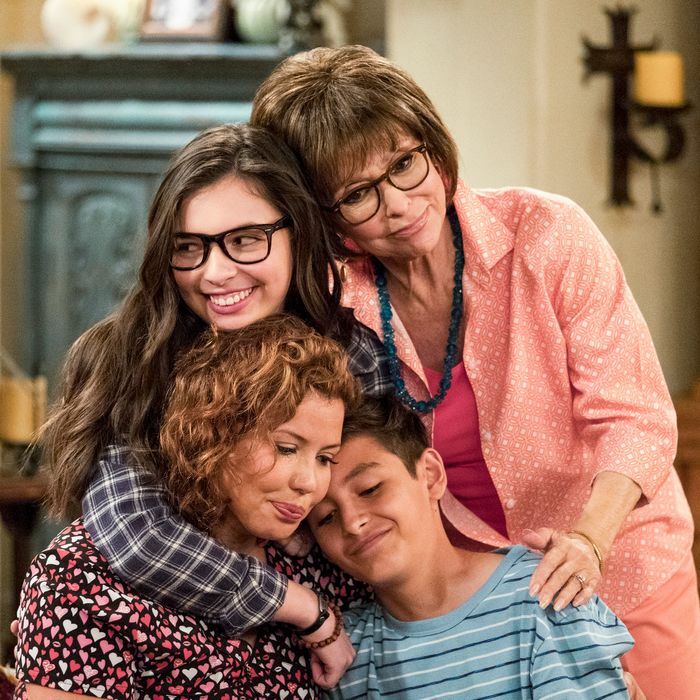 The reboot of One Day at a Time debuted on Netflix last January, when a traditional, uplifting sitcom about an immigrant family could not have been more needed. Now, a year later, the arrival of season two somehow feels even more necessary and timely. The second season of this earnest half-hour Cuban-American family comedy premieres Friday on Netflix, complete with a story line in which two characters attempt to become permanent U.S. citizens. That means it will be viewed at the same moment that Congress and the president continue to spar over DACA, and just three days before the administration is slated to roll out its official immigration policy, which, up to now, has been pretty far from welcoming to Latino families like the fictional Alvarezes. The parallels between what happens on the show and what’s occurring in the real world are coincidental to a certain extent. These 13 episodes of One Day at a Time would have told the stories they were going to tell regardless of current headlines because they were written and shot months ago. Still, it’s clear that executive producers Gloria Calderón Kellett, Mike Royce, and Norman Lear, along with their team of writers, feel compelled to tackle topics that carry extra social currency right now, and to do so by swinging between light, accessible comedy, and genuinely moving drama. Along with their excellent cast — including national treasure Rita Moreno™, proving yet again that she’s still got it at age 86 — they continue to walk that fine tonal line with grace and an infectious sense of joy. Television may have become overly reliant on reboots, but One Day at a Time is evidence that they can not only work, but rise to the cultural moment of their resurrection. While the name Donald Trump is never uttered once during the second season of One Day at a Time, the show’s point of view about his presidency is hardly a secret. In episode four — which kick-starts efforts by Lydia (Moreno) and building super/Canadian Schneider (Todd Grinnell) to pursue American citizenship — Lydia admits she’s never voted in a U.S. election. Her granddaughter Elena (Isabella Gómez) chastises her, noting that her lack of participation is what got this country in its current mess. “Now we have that monster in the White House,” she says. The show certainly deals with serious issues that fall in the political realm — prejudice, gun control, immigration — but it balances those with the regular stuff of life, including the relationship between single mom Penelope (Justina Machado) and a handsome fellow military veteran named Max (Ed Quinn), a name that echoes the one given to Julie’s husband from the original series; Penelope’s efforts to pursue a nurse practitioner’s degree; and the budding romance between Elena, who came out in season one, and her first girlfriend Syd (Sheridan Pierce). Ultimately, the most political thing about One Day at a Time is the way it shows us a Cuban-American family continuing to thrive and love the United States, despite the negativity its government lobs at people like them on a daily basis. One Day at a Time is a traditional sitcom in a lot of technical ways: It’s shot with multiple cameras, in front of a live studio audience, and comes with an audible laugh track. In keeping with that approach, sometimes its jokes can be a little corny, especially in the first two or three new episodes, when season two is still trying to lock into its groove. (In episode two, Elena’s obsession with going to protest marches is dubbed “march madness.”) The fact that Elena and Syd are both nerdy is also played a little too heavily for laughs, though that’s offset by the fact that the show treats their relationship with sensitivity and openness. The two even share a tasteful but lengthy first kiss, something that, even now, I am not sure some broadcast sitcoms would handle so comfortably. From episode four onward, though, it’s in appealing and touching form, especially in the gut-wrenching finale, which is best left totally unspoiled, and in episode nine, when Penelope decides to go off her antidepressants, convinced that, with a new boyfriend and life seemingly on track, she doesn’t need them anymore. Machado — who is always wonderfully down-to-earth and as deft at wry comedy as she is in quiet emotional moments — is just outstanding in a half hour in which Penelope breaks down and battles against the reality that she may need medication for the rest of her life. That episode stands right alongside the current season of Crazy Ex-Girlfriend as an example of how to honestly depict the weight of mental illness while simultaneously removing the stigma associated with it. Machado is surrounded by actors who get even more of an opportunity to stretch themselves this season, including Gómez, Marcel Ruiz as Penelope’s overconfident son Alex, and Grinnell as the privileged, clueless, but sometimes surprisingly smart Schneider. There are some fun cameos, too, from original One Day at a Time star Mackenzie Phillips, who reprises her role as Penelope’s therapist, to Mary Tyler Moore Show alum Georgia Engel as a strict nun at the Catholic high school Penelope’s kids attend, and that she once did, too. But the brightest light of all is, no surprise, Moreno, who is physically incapable of being anything less than delightful. Moreno is Puerto Rican, but she slathers a thick Cuban accent on every word Lydia utters. Another actor might seem too showy for doing this, or lean too far toward caricature, but Moreno is so confident that she wears that accent like a badge of honor. She also can take the simplest of lines — like the single word “okay” — and elongate them until they contain at least seven layers of meaning and three punch lines. Most refreshingly of all, she’s an unapologetically sexual being who speaks openly about the passion she shared with her late husband (Tony Plana) and doesn’t hesitate to swivel her hips when the moment presents itself. Moreno even has some fun with her own legacy. In that previously noted fourth episode, Penelope tries to get to the bottom of why her mother has never applied for citizenship. “Don’t you like living in this country?” she asks Lydia. She says the line straight, but come so close to singing it that it’s impossible to forget she once did exactly that in West Side Story. It’s a very funny, well-played moment, and one of many reminders in One Day at a Time that we are so lucky that Rita Moreno is still entertaining us and bringing the same vigor to the sitcom that she brought to Sondheim and Bernstein decades ago.